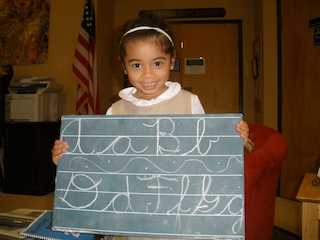 Students love to learn in an AMI Montessori School! The term "Montessori" is not trademarked and, as a result, not all Montessori schools are the same. The AMI Montessori curriculum and class structure of Riverstone employs the original format designed by Dr. Maria Montessori. It is used world-wide and is the most complex and advanced system currently in practice. Not only does it help students develop the ability to advance (both academically and socially) more rapidly than traditional educational methods, it also provides important training in research, organization and presentation skills. This combination of professional and personal development prepares students for future success in any advanced academic environment. Riverstone Montessori Academy invites parents, educators, policy makers and other citizens concerned with improving education for all children to contact us for more information on the Montessori philosophy. We also invite you to schedule a tour and see something truly unique in education. How do we provide the most Advanced Education in Cobb County? CURRICULUM: The key component to academic success is a school's curriculum. Even if you have a younger child, we encourage you to visit all of our classrooms and see how far your child can advance in the Montessori Elementary and Adolescent Program environments. Traditional education is a combination of many different unrelated, often untested, curriculums and classroom designs. As a result, students must adapt and re-learn each new routine or approach as they change subjects, classes, teachers or grades. The AMI Montessori curriculum, which was developed over 50 years of scientific study, takes a longitudinal approach to child development with a design that is interrelated from age 3-15. As students mature they easily advance and add new responsibilities and expectations without the unnecessary delay or confusion of changing educational environments. This approach allows us to introduce more advanced concepts at an earlier age and reinforce them as the student progresses for a more complete understanding. This is true internationally as well. An AMI Montessori student from Japan, India or Britain can easily integrate into a classroom in the U.S. since the materials, classroom design and curriculum are all uniform and work cross-culturally. TRAINING: The training an AMI Montessori teacher (even in pre-school) receives is considered a Master's Level education when administered in a University setting. This is an important distinction from many educators who may be "certified" or trained in general education principles, but not trained for the administration of the specific curriculum they are using. 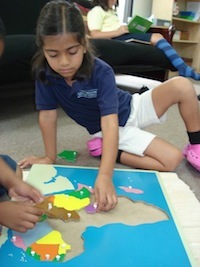 AMI Montessori teachers can teach in all subject areas and are employed in most countries throughout the world. Our Primary curriculum extends into the 3rd grade of traditional education and our Elementary and Adolescent Program curriculum extends into traditional High School and College studies. No child is left behind in AMI Montessori. MATERIALS:The materials you see in our classrooms have been scientifically designed over 50 years of study. Many of the current "advances in education" are merely copies of Montessori materials and practices that have been in place for over 100 years. A Montessori classroom has more dollars spent per square foot for educational materials than any other private school. Current neurological studies of child development continue to support the AMI Montessori manipulative curriculum and explain its continued success. 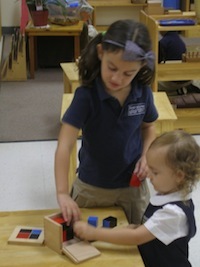 TRANSITIONS: Students in the Montessori tradition often stay with the same teacher for a 3-6 year time span. Our teachers are trained to instruct in all subject areas for this span of development. This allows a teacher to fully understand a student's individual strengths and challenges and address them academically. Likewise, students are familiar and comfortable with the teacher, class routine, expectations and curriculum. They can spend their time focused on meaningful activities rather than adjusting to constantly changing rules and expectations. OUTCOMES: Recent studies comparing Public Montessori schools with their conventional counterparts illustrate the advantages of our program for both remedial and advanced students. Montessori students outperformed their peers in science and math and demonstrated better creative writing skills and more adept/mature social skills. 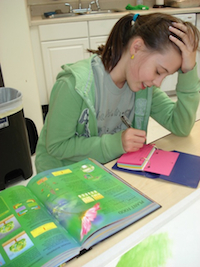 At Riverstone Montessori Academy, our students' standardized test scores are typically years above grade level. Unlike most private schools that exclude remedial students and only accept advanced students, our curriculum is designed to help a full range of students succeed. Children who are willing to learn will feel good about themselves, regardless of their abilities. This confidence will allow remedial students to make unexpected academic advances. Academically advanced students come to Riverstone Montessori when they reach the academic ceiling of the traditional program. The AMI Montessori program will allow these students to continue to accelerate their academic achievements. Riverstone students can easily outperform the lower expectations of conventional education and leave school each day feeling good about themselves and their ability to succeed.